There are many reasons why Social Housing providers such as Housing Associations, Local Authorities and Registered Social Landlords should consider renewable energy for their housing stock. Among the many advantages of renewable energy for tenants is that Heat Pumps for example are safer, cleaner and more efficient than traditional oil or gas fired boiler systems, and can significantly help to protect tenants from the growing issue of fuel poverty due to the substantial cost-savings they can provide. Solar Photovoltaic (Solar PV) systems provide another way of combating fuel poverty by generating ‘free’ electricity for properties thereby reducing energy bills for tenants. “Why Work With Global Eco”! 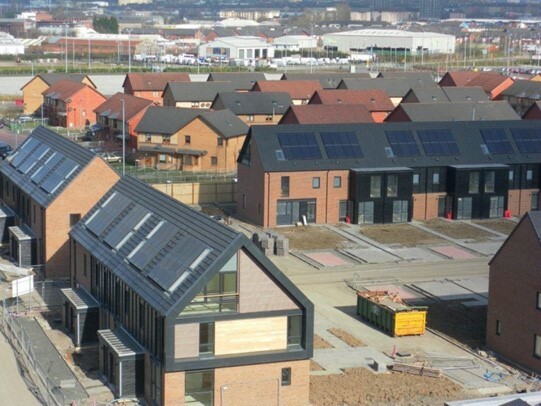 While there is no doubt that renewable energy has the potential to be a very cost-effective and highly beneficial option for Social Housing providers, it’s vitally important to select the most suitable project partner in order to maximise that potential. We have a proud history of providing solutions and advice on renewable energy for Social Housing providers. We have worked closely with a host of Housing Associations, Local Authorities and Registered Social Landlords on a range of retrofit and new build projects that have benefited both the organisations involved and their tenants. An example of solar Pv integrated into the roof tiles. 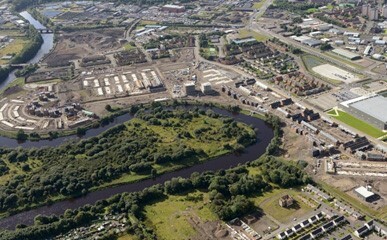 This development picked up an award for the best green initiative at the prestigious homes for Scotland awards. Objective is to design and deliver the most effective solution for providing renewable energy for Social Housing providers and to work with each organisation ensuring their project is tailored to meet their specific requirements. We will meet those requirements by fostering a close working relationship with all relevant parties from Asset Managers to the tenants themselves. 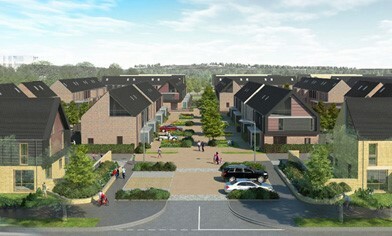 We believe it is vital for the Housing Associations, Local Authorities and Registered Social Landlords we work with to have a complete and thorough understanding of all the options available, and once committed to the project, have every relevant support service in place before, during and after the project goes live. As a responsible Social Housing provider, you take great care to ensure the welfare of your tenants so it’s imperative that when choosing a partner to supply your renewable energy needs, you have the confidence and trust that the company you are considering can deliver what they promise. Our experience extends into Air Source Heat Pumps and Solar Photovoltaic (Solar PV) systems, Biomass Solutions, and Ground Source Heat Pumps, providing us with the products and skills to supply the most effective solution for you and your tenants. Through our significant experience in the sector, we understand the many issues facing Housing Associations, Local Authorities and Registered Social Landlords from budget management to tenant safety as well as, but more importantly, creating “Affordable Warmth” for your tenants. Because of this understanding and our expertise within the renewable energy industry, we are ideally placed to provide the most practical solutions and advice on renewable energy for Social Housing providers and Local Authorities. We can also work with you to identify renewable energy funding, an all important factor when managing budgets. We have an in house Consultant with vast political experience to assist us and you, in the lengthy process and often confusing arena of public funding. We design a solution and supply expertise ensuring you have the renewable energy products to do the job as and when required. Full project management services are provided to give complete peace of mind throughout the duration of the works. There are no unwelcome surprises around cost. Our fixed price works include the drilling of boroscope holes where necessary, using our considerable experience in this field to ensure the retro fit works meet with the projects requirements. We will support you and your tenants with both pre-works consultation, as well as providing tailored hand over packs to ensure they understand the technology before and after installation. Ongoing support is vital, therefore we provide a service support structure that includes quick response initiatives and a life-time support service utilising the considerable skills of our dedicated team of nationwide engineers. Another important factor for Housing Associations, Local Authorities and Registered Social Landlords to consider are the credentials of the company they are partnering with. Our Company and our products are accredited under the Microgeneration Certification Scheme (MCS) which is vital in securing access to incentives such as the Renewable Heat Incentive (RHI) the Feed-in-Tariff and Renewable Energy funding as a whole. We are members of the Renewable Energy Consumer Code. Demonstrating our dedication to a management system which ensures our products and services meet the requirements agreed with our customers at all times.